Michael Gove worked for David Cameron under the successive coalition and Conservative-majority governments, serving as the Secretary of State for Education from 2010-14 and then as the Secretary of State for Justice from 2015-16. He was first elected as the MP for Surrey Heath in 2005 and took a leading role in orchestrating Brexit, working as the co-convenor of the Vote Leave campaign committee. Gove has begun serving as Vice Chair of the Select Committee for Exiting the European Union and returned to his weekly column in The Times. 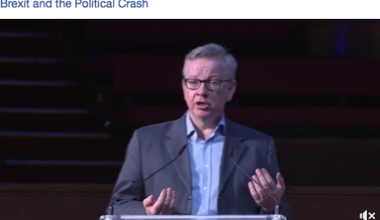 Michael Gove spoke this week-end at 'Brexit and the Political Crash', The Convention in London: “For me, it was primarily about making sure that whoever exercises power over you, is someone that you can throw out.” Keynote speech.